Posted on 8/28/2018, 11:53 am, by kittykill, under Tute Tuesday. Creating pleats doesn’t have to be intimidating when you use BoatsandSew’s tutorial for a Pleated Scrap Bag. 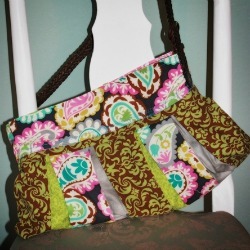 Using bits of leftover fabric you can sew a one of a kind purse that will be the envy of every fashionista. While this project does take some sewing skills, it is in no way difficult for the novice. Don’t be afraid to give it a try. Her step-by-step photos will guide you through the process and, of course, Craftster members will be there to cheer you on and help you out. Once you have the technique down, you can make a purse to go with every outfit. From crochet to embroidery to sewing, trying a new craft is easy when you access our Tutorial Cloud. There is something for everyone!